Aplica is an application for both Android and iOS devices which will help users in finding and applying for different degree programs in international universities. It helps to locate local consultants too who can guide you in the admission process. Aplica is a platform which has been helping students get access to international universities by connecting them with consultants. Aplica has both, an online web portal and native mobile applications, which can be used to search for different programs in many international universities. Aplica’s core philosophy is to facilitate students, who aspire to study abroad, by providing them with a free of cost digital platform. It enables them to research their university options from the comfort of their homes. The student will be able to talk to the ‘Authorized University Representatives’, dubbed as consultants, and build their options from their smartphones. This platform is currently available in Pakistan and soon will be rolled out to other parts of the globe as well. Aplica has mobile applications for both Android and iOS devices. The application offers a similar user experience on both devices thanks to a uniform design by Aplica. Here’s a quick look at some of the features that the applications provide. Aplica asks you to enter your required degree program and desired countries while signing upfor the service. This information is then used to show you a list of suggestions of universities where you can apply. 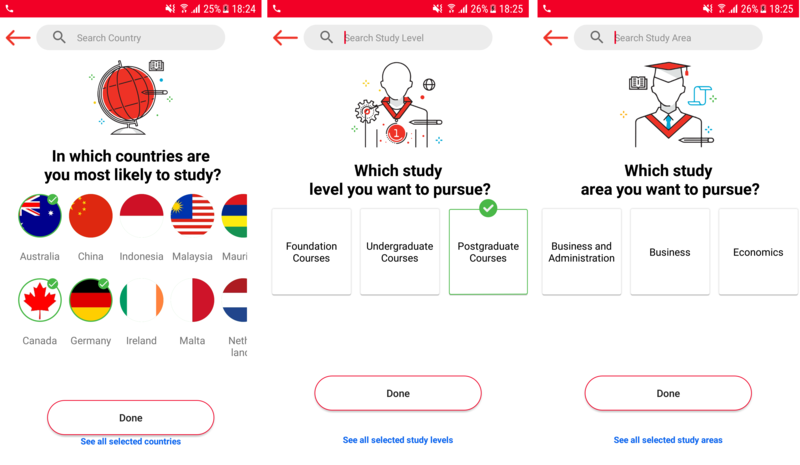 ­The app first asks you which country you want to study in, then it asks for the level of the study that you want to pursue and then finally the areas of your interest. Most of the popular countries are covered in the application but one big omission that I found was of France. It’s quite a popular destination for engineering students and its omission is a little surprising. The homepage of the application shows you a list of all the universities that have the degree program you previously selected. You can filter through the list using the search bar at the top of the list. Opening a University shows the consultants available for that institution along with the degree programs it offers. You can tap on a consultant to get the contact info and visiting hours. Aplica also allows you to message the consultants and get quick recommendations from them. You can tap the message button in front of any consultant and initiate a message thread quickly. There are also contact details like phone numbers and office hours present for most consultants. Another useful aspect of Aplica mobile application is the test section. It includes useful links and information about some tests which are required by international universities. This section includes information about what areas the tests cover, what it is used for and how much does it cost. There is, unfortunately, no method to apply for the tests right from the app, and sometimes the application opens the test info in an internal browser which doesn’t seem like a well thought out user experience. If you are a student who is looking to study abroad and is in desperate need of guidance, you should give this app a try. It does make the whole process of sorting through different international universities a breeze and the bonus feature of consultant information is a welcome addition. If it sounds like this application is something you would like to try out, you can go ahead and download it from the iTunes store or Google Play Store. You can also use Aplica’s services by using its online portal by visiting this link.